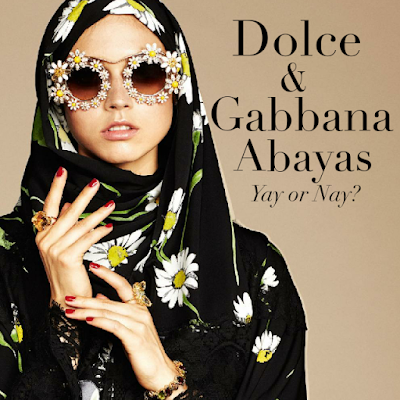 Dolce & Gabbana Abayas: Cultural Appropriation or Cultural Energisation? There is debate among Muslims whether Dolce & Gabbana's recently released collection of luxury abayas is a form of cultural appropriation ('plundering') of the Muslim culture or a means of 'energising' it. We covered the issue of cultural appropriation when I was tutoring for an introductory paper on Media Studies last year and I think the Dolce & Gabbana abaya collection would make a great discussion for this topic. To 'plunder' or culturally appropriate artefacts from their originating culture is to "strip away local meanings and introduce these goods into an alternative regime of value dominated by commercial interests" (Jenkins et. al 270). In other words, to use someone else's culture to make monetary gain from it. To 'energise' a culture, on the other hand, is to respectfully create visibility and awareness about a culture by educating others about it. Dolce & Gabbana's line of abayas was without a doubt a calculated business decision. The Muslimah fashion industry generates billions of dollars let alone the luxury and high-end industry in Muslim countries. Fortune reported that Muslims spent $266 billion on clothing and footwear in 2013 and according to Sporazine the sale of personal luxury goods in the United Arab Emirates and other Gulf countries amounted to $8.7 billion in 2015. Dolce & Gabbana would be crazy not to try and tap into the Muslim market because their goal is after all profit maximisation. Let's not forget DKNY and Tommy Hilfiger released their respective Ramadan collections in 2014 because research reveals Muslims spend more during Ramadan than any other time of the year. I can understand why some Muslims find this to be a positive development. Having the DKNY, Tommy Hilfiger and Dolce & Gabbana brands added to their choice of clothing excite Muslim women, particularly those from the Middle East, who are ready to spend thousands of dollars on high-end bags and clothes for various reasons, such as personal satisfaction and the construction of their identity. Furthermore, it signifies acceptance and maybe even a celebration of the Muslim code of dress for women by a European fashion powerhouse. Will luxury collections of Muslimah clothing 'energise' Islam and Islamic cultures? Maybe as a by-product but not as a core intention of these companies. Do we need 'the West' to validate how cool, sophisticated and trendy we are as Muslims? I hope not. Does it have to be either cultural appropriation or cultural energisation - can it be both? Perhaps, depending on how you make your case. As a woman who grew up as the daughter of a Fashion Design lecturer and having work experience in the fashion industry myself, I cannot help but think that the contemporary fashion industry is driven by materialism more than anything else. There's nothing wrong with liking trends and beautiful clothing but they didn't used to be the end-all-be-all of our identity. Fashion and clothing used to be mainly about creativity, practicality, function and craftsmanship until capitalist motivations took over and they became part of what is called the 'lifestyle culture'. Capitalism and lifestyle culture promote the prioritisation of individual happiness which leads to classism, consumerism and the exploitation of people, animals and the environment. This does not mean we are doomed as consumers. We have alternatives and we can choose to purchase from companies that support local industries, ethical production and sustainable living. A few years ago, I helped organise a small modest wear fashion show and participated in a question and answer session with Muslim women at the Twins of Faith Conference in Malaysia. One of the ladies in the audience asked a very good question: "How do we balance being fashionable while maintaining modesty, as in being modest in the way we spend?". "Well, there are ways to be fashionable without spending a lot of money. Why do we need bags that costs thousands of dollars when there are people starving out there? I think that's something we need to ask ourselves," I replied. I liked the question not because it made me seem self-righteous but because it made me think about my own spending behaviour. Personally, I don't need an abaya that costs thousands even if I could afford it and if anyone I know would like to buy a Dolce & Gabbana abaya it's not my right to stop them but I may just give them a nudge to make them think about their choices and what it means to them. I'm writing this as someone who bought a Gucci oud perfume over an 'ordinary' oud perfume because it not only smelled nice but I also liked the 'idea' of it, by the way. I get the temptation, I really do. A great write up! You argue your points so well. Very good article. I've seen some really talented abaya fashion designers in the The United Arab Emirates. It would be nice to see my Muslim sisters gravitate to these [Muslima] designs more so than other designers just looking to capitalize on our culture. Your writing never fails to inspire! Especially the "it's not my right to stop them but I may just give them a nudge to make them think about their choices and what it means to them." Such a good content. Who knows we Muslim spend the most during Ramadhan.